Paul Rose a great bloke, top blade and machine shearer, competition judge, and World record referee. 2 time NZ Golden Blades winner, Originally from Motueka and spent the last 20 plus years farming near Fairlie, Geraldine area. Passed away in October 2005 way too soon, 56 years and 11 months. One of New Zealand�s legendary shearers from the 1960s, Robert Benjamin "Bing" Macdonald of Waihau Bay, has died at Whakatane [Friday 21 May 2004] after a period of ill health, aged 76. Mr Macdonald grew up in the Waikato and worked on farms around Kawhia before becoming a full time shearer at the age of 20. He quickly established himself as a true "gun" in shearing sheds throughout the North Island, as well as a stylist on the competition stage, winning consecutive New Zealand championships in 1959 and 1960. With more than 40 open titles already to his credit, Bing Macdonald was firm favourite to win the inaugural Golden Shears at Masterton in 1961 but an accident two weeks before the event left him with a dislocated shoulder. It is part of New Zealand shearing folklore how, with heavily strapped shoulder, he went on to make the six-stand final and finish a close third behind Ivan and Godfrey Bowen of Te Puke. Macdonald returned to Masterton a year later  and rightfully claimed the Golden Shears crown, a feat he repeated in 1966. Macdonald�s second victory earned him a trip to Britain where he demonstrated the New Zealand method of shearing to British audiences, including a royal performance for Queen Elizabeth II and the Duke of Edinburgh. 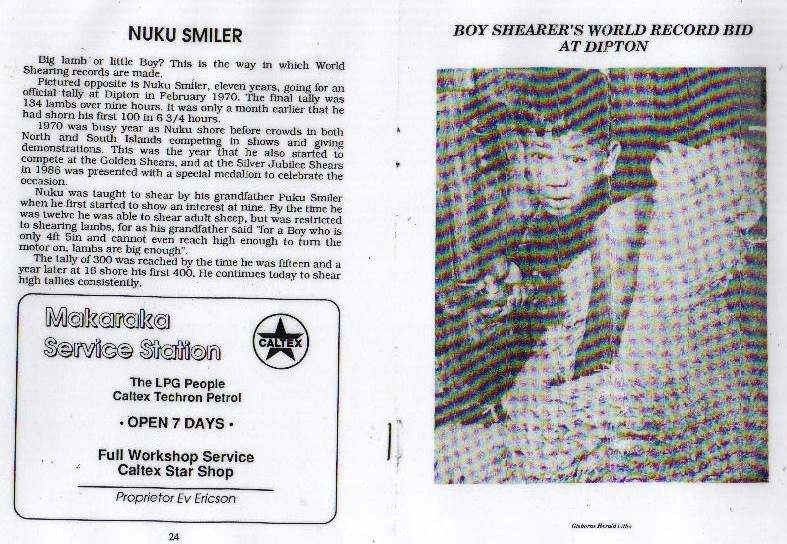 He remains one of only six shearers to win at Golden Shears more than once. Bing Macdonald was one of the first North Islanders to undertake contract shearing as a large scale business, operating gangs as far afield as the western bays of Lake Taupo and Taihape from his Hamilton base in the 1960s and �70s. He lived the last 15 years of his life at Waihau Bay, east of Whakatane, where he enjoyed recreational fishing. Famous people are usually ordinary people from ordinary places. Kevin Sarre began that way but he became the world�s �top-gun� shearer on narrow shearing combs as his career unfolded. Although he is now deceased the public can now come to the Lockington & District Living Heritage Complex, and from the street, view Kevin Sarre�s sculpture in a glass showcase. 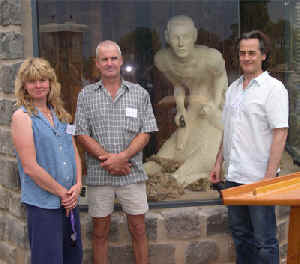 Kevin Sarre won�t stop shearing thanks to South Australian Sculptor, Ivo Tadic of Mount Gambier, an esteemed stone sculptor, the 2 x 2.5 tonne blocks of limestone, cut from the quarry over 100 years ago, were freighted to Lockington and the rest is history. Ivo chopped, drilled, cut, filed etc. 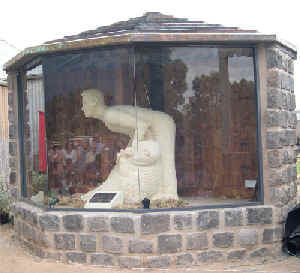 a life sized sculpture of Kevin Sarre shearing a sheep. On Sunday, November 30, 2003 in Lockington, Kevin�s childhood town, in a prominent position in front of the Living Heritage Complex, Campaspe Shire Mayor, Murray McDonald, unveiled the sculpture for all the world to see. Kevin�s proud children, Garry, Deanne ( from Western Australia ) and Ricky, and four grandchildren were at the event, and would have battled to remain dry eyed when the magnificent sculpture was revealed, then also when Hec Griffiths sang a song that he and Lesley Tracey co-wrote as a tribute to Kevin, called 327 Down the Chute. So good was the song Hec was asked to do a repeat performance during the afternoon tea session. Lockington is so honoured to have reared Kevin Sarre who achieved National Champion 5 times, a Golden Shears Winner in 1963, and World Shearing Record in 1965 of 346 merinos, and we�re proud to be able to look at his monument. The Heritage Complex is proud to have preserved the achievements of this local man who went on to develop the Tally-Hi method of Shearing, becoming a shearing instructor and teacher whose wool industry contribution is almost unparalleled. Over 300 people witnessed the unveiling.The bronze plaque simply reads; Kevin Frank Sarre 1933-1995 5 times National Champion A Golden Shears Winner 1963 World Shearing Record 1965 - 346 merinos. Mr. J. Wesley Wilton MBE, United Kingdom Secretary/Treasurer of Golden Shears World Council 1996-2003 has passed away on Saturday 15th November 2003. Current Secretary/Treasurer of World Council, Arthur G. Rundle said �We have lost a true and wonderful friend who will be missed by many. Sheep shearing throughout England, the British Isles and the World will be the poorer for his passing. We must be positive and continue to strive and maintain the standards and beliefs Wesley held so dear. We are the richer for having known him.� - Sincere sympathy to his wife Ruth and his many friends. After discussions, Mark was told it was back to school or find a full time job. Mark decided that he would like to try his hand at shearing. Along with brother John he was offered the opportunity in Longreach, Queensland. They boarded a train at spencer street Melbourne with some motivating words ringing in their ears. The words of Conlan senior who told them that he didn�t think they would make shearers. Perhaps Conlan senior hoped his sons would do something more than enter an industry which had long had a dubious reputation. Mark Conlan's life did much to dispel that image. Mark made the long trip to Queensland with brother John and the journey into the shearing industry began. As time went on, Mark and John built a strong reputation as shearers, naturally gravitating towards competition shearing. Mark soon made steady progress through the competition ranks. Mark kept his shearing simple and worked on two main factors that were at the core of his success: Quality and Speed. Mark Conlan possessed the x factor; a fiercely competitive nature, a winning attitude and a burning desire to reach the peak of his profession. At about this stage of his life Mark set some major goals for which he would strive. The first was to set a shearing tally with brother John beside him at Lancefield Victoria On December 4 1979, and using 'narrow' shearing gear, the two brothers shore sheep for sheep to set a record of 426 each in 7 hours and 15 minutes, before running out of sheep. This record still remains today, and will never be broken. Then Mark set about achieving his second goal of winning the Australian Golden Shears Title. Mark achieved this in 1981. Where he was crowned Golden Shears Open Champion. Mark on being presented with his trophy and sash said �tomorrow I will have a beer and Monday morning I will start practicing to try and win it again next year�. Well practice and win it again he did in 1982. After winning the Golden Shears again Mark on being presented with the trophy by Prime Minister Malcolm Fraser, Mark said �with all due respect Mr Fraser, Its been bloody hard labour�. Mark won the title again in 1983 and amid the wide comb dispute in 1984 Mark triumphed again. Mark won the last 4 Golden Shears ever held in Australia. He disciplined himself to shear sheep at the highest of quality at pace, so when under pressure in competition the two simple factors would shine through ( Quality and Speed). Stan Artridge a shearing instructor and competition judge at this time had this to say: "Incredible shearer Mark, he had it all, every ingredient you�d want in a shearer. I�ve seen Mark shear some incredible tallies and always kept the quality right, there is no doubt Mark was the best shearer in the world through this time�. Marks next goal was to prove to himself and the rest of the world that he was the best, and win a World Championship. This opportunity presented itself in Perth W.A. in 1986. Mark defied an AWU ban on eastern state shearers shearing in W.A to compete. Mark dominated that World Championship Final chased hard all the way by a young N.Z shearer by the name of David Fagan. Both merino and crossbread sheep were shorn in the final, and Mark spoke later of how determined he was to win. It all comes down to that desire and the will to win, and this was Marks greatest motivating factor. This, and his incredible ability and application made Mark the first Australian to win a World Championship in shearing. Mark won many competitions there after including a world merino event in South Africa, and represented Australia on many occasions. He plied his trade in many countries around the world and toured Europe as an ambassador for the 'Sunbeam' company, demonstrating shearing gear and promoting the latest equipment. Mark and John established a shearing competition at Kyneton in the late 80s of which Mark was a chairman for many years. Marks wife Joanne Conlan created a woolhandling competition in conjunction with the shearing. kiwis, and the sending of an Australian team to World Championships around the World. Mark ran a successful shearing business out of Kyneton employing up to 50 staff at peak times. Marks next goal after making his money was to get out of shearing. With wife Joanne and children he was able to establish himself in farming at Elmore. Purchasing a couple of property�s, Mark set about becoming the best farmer he could be.With that competitive nature ,he regularly topped the market with prime lambs and produced the heaviest bullock ever processed at O�Connor�s meatworks. "l just like to stick it up em" he would say. Mark Conlan took considerable pleasure from being able to look back and say that with Joanne and family working beside him and encouraging him, he was able to set major goals in his life and achieve them through shear hard work. He did it because of the challenge that it presented. Mark was adamant that the feeling of setting those difficult goals and then achieving them by hard work takes some beating. In shearing, as in life, Mark Conlan set a standard which will be measured for decades to come.